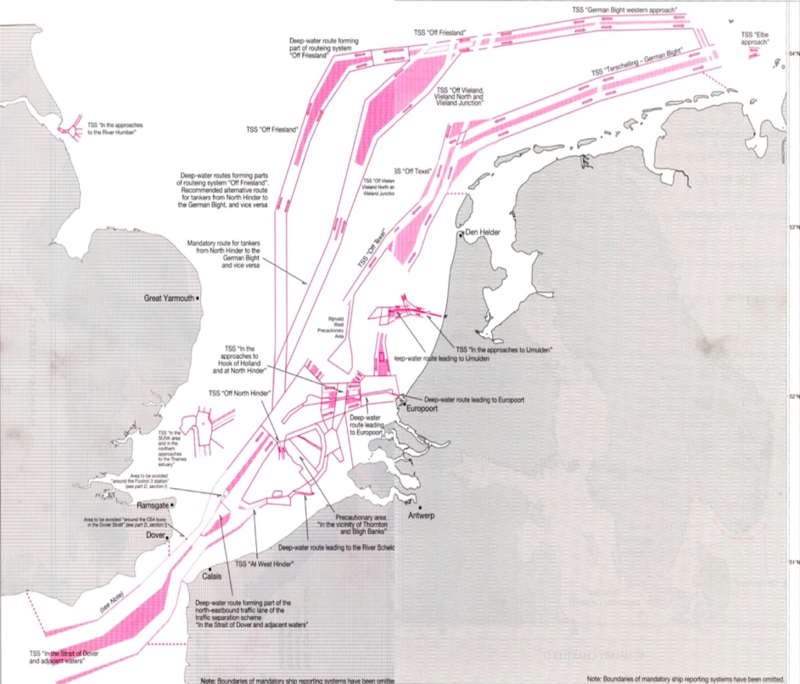 The report, produced under the NorthSEE project, provides a brief history and context of shipping in the North Sea and an overview of current routes used by vessels. Based on these routes, the shipping designations in national maritime spatial plans of the North Sea countries are researched and possible inconsistencies between designations and actual used routes highlighted. Besides this, the report deals with future shipping industry trends, and their possible spatial implications. A more detailed overview is provided on the conflict between future shipping and future offshore energy developments. 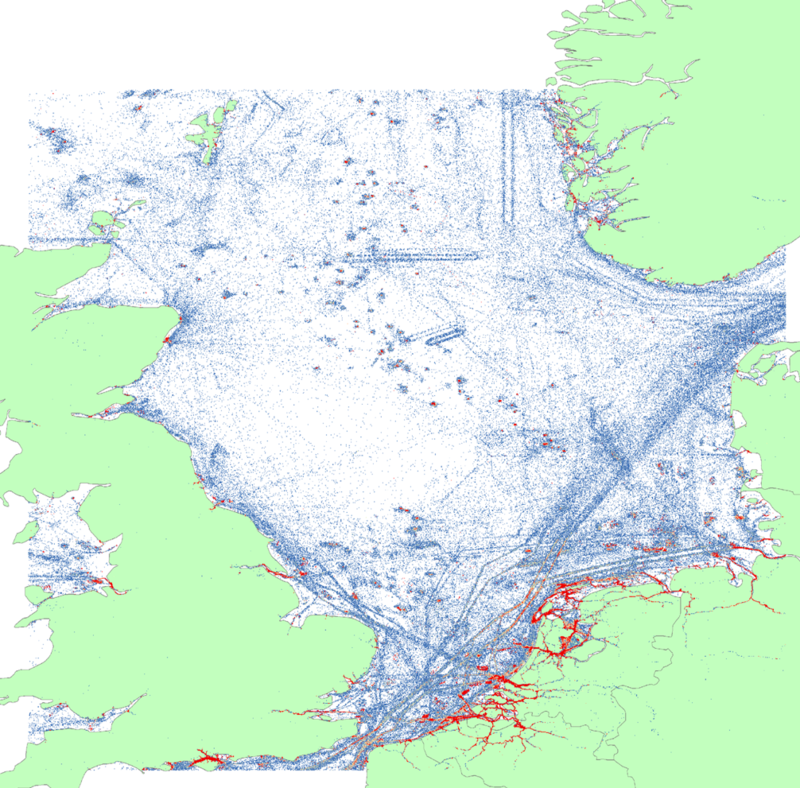 What are the current routes used by vessels in the North Sea? 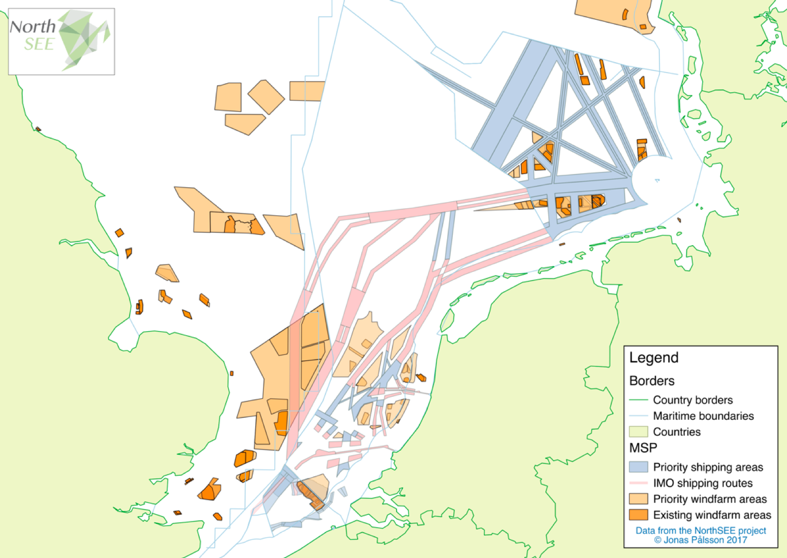 What shipping routes and measures are designed in Maritime Spatial Plans in the North Sea? What are the future industry shipping trends? How can the future shipping trends and offshore wind farms affect each other in the North Sea? The NorthSEE project promotes a better exchange of information among MSP authorities, related experts and institutions in the North Sea Region (NSR). NorthSEE aims at achieving greater coherence in MSP across the NSR, for three topics of transnational nature: environmental aspects, shipping routes and energy infrastructure This report is specifically focused on shipping routes and future shipping trends in the North Sea region. Provide an overview of shipping routes currently used by vessels in the North Sea and compare them with routes described in national maritime spatial plans of the North Sea countries. Provide an analysis of future trends of shipping and other maritime activities and how they affect each other, with emphasis on offshore wind farms. The NorthSEE project partners, which are the MSP authorities, have been actively involved in writing and reviewing the report. At the start of the NorthSEE project, all MSP authorities were asked to fill in a questionnaire related to shipping routes and future shipping development, as well as to provide the designated shipping areas in their MSPs, and possible AIS (shipping satellite data). Based on these findings, the chapters have been developed on the current shipping routes and inconsistencies with designations in Maritime Spatial Plans. For the parts of future industry trends, the report writers have been in close contact with expert stakeholders, for example the International Maritime Organisations (IMO) as well as national stakeholders (Flemish Shipping Organisation). AIS data on vessel traffic in the North Sea shows that the area is intensely trafficked throughout the year, with certain increases in the summer months (see picture 1). In the south part and along the coasts shipping is more intense than in other areas. Ships’ routing measures were originally established for safety reasons and points out a predetermined route for ships to sail in order to minimize risk of accidents and other hazards. IMO is the only international body recognised for establishing ships’ routing measures. Several routing measures are established in the North Sea, in particular in the southern parts. Individual states have designated certain areas of their sea areas as priority areas for shipping. In these areas, shipping is granted priority over other sea-based activities. North Sea states have had transnational dialogues with regards to planning and designation of shipping routes and OWF. However, these consultations did not always take place under the umbrella of MSP but more on a sectorial basis. Sectorial consultations, as opposed to MSP discussions, run the risk of not taking into consideration effects of sectorial activities on other activities. The absence of a common North Sea platform for MSP discussions on shipping and OWF was not pointed out as a concern or problem during the interviews carried out with MSP authority representatives in the North Sea countries. The EU directive on MSP promotes it as a tool which will provide a holistic approach to management of sea uses. As for future trends in shipping and MSP, it is important to keep in mind that shipping is a highly market driven activity and its development is largely determined by the demands for foreign goods and services. The shipping sector is still affected by the financial crises in 2008 and together with the low level of global GDP growth predicted by IMF, growth in shipping is likewise predicted to be slow in the coming years. However, shipping is the main mode of transport for goods around the world and, hence, a major activity to be considered in MSP. Another important issue to be considered in future trends of shipping is innovation and technological development. The size of vessels was thought to have reached a threshold some years ago but we continue to see a remarkable development in this field. Although there seem to be no limit to how large vessels can be constructed, there is a limit for these ships in port areas. If ports are to accommodate larger ships, there is the need for expansion which will have a direct impact on the surroundings in several ways e.g. spatial, environmental and safety. New off shore activities like wind and wave farms will also have spatial implications which need to be considered in MSPs. Not only the physical infrastructure itself, but also the supply vessels needed to operate and maintain these activities need to be taken into consideration. These vessels will go where they are needed, which may or may not follow established shipping routes, and hence adds another reflection for the planning and management of shipping in MSP. The report describes the status quo of shipping vessels and designated shipping routes by IMO and national MSPs. It attempts to find matches between the actual vessels routes, and the designated shipping lanes. Also, in other sea basins possible inconsistencies can be found in the actual vessel traffic and IMO/MSP routes. Therefore, the recommendations of the report on transnational cooperation on these issues is also relevant for these other sea basins. Considering industry trends, most of them are taking place on a more global scale. Technologies have to be adapted to a specific region and circumstances, for example the depth and harbours of the North Sea. However, the report provides an interesting overview of these trends and possible spatial implications, which could be used by stakeholders and researchers and is relevant for other sea basins.